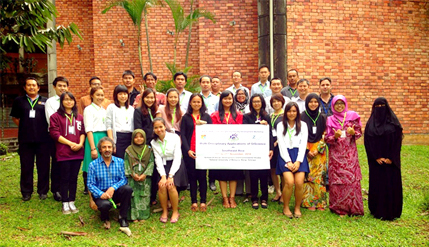 BANGI, 1 December 2014 – Some 29 academicians and postgraduate students from 16 universities in five countries successfully completed a week-long capacity-building workshop on Geographic Information Sciences (GIScience) organised by The National University of Malaysia (UKM) and the University of Salzburg of Austria. The participants from Malaysia, Indonesia, Philippines, Thailand and Vietnam were led by Dr Lam Kuok Choy of UKM and Dr Shahnawaz from University of Salzburg on individual projects beginning November 17th covering a range of multi-disciplinary applications of GIScience in Southeast Asia. UKM was the only Malaysian university which took part. They used the highly-specialised ArcGIS Desktop software and presented the outcomes in the concluding session here recently following a field excursion. ArcGIS is a GIS software for working with maps and geographic information. It is used for creating and using maps; compiling geographic data; analyzing mapped information; sharing and discovering geographic information. The workshop was organised jointly by the School of Social, Development and Environmental Studies (PPSPP) at the Faculty of Social Sciences and Humanities (FSSK) UKM and interdisciplinary Centre of Competence for Geoinformatics (Z_GIS) of the the University of Salzburg as well as partner institutions and the geospatial community worldwide. Co-funded by ASEA Uninet, Austria, the programme was launched by Head of PPSPP Dr. Abdul Hair Awang. Prof Mastura Mahmud, Deputy Dean (Research and Innovation) awarded the certificates of successful completion to the workshop participants. ASEA Uninet is the ASEAN European Academic Network of ASEAN and European universities formed in 1994 to strengthen cooperation and joint research in Science, Medicine, Pharmacy, Economics and Social Sciences.